This Fun Pack is like a Dinosaur zoo! Good Luck Minis® are tiny hand-painted replicas. These soft figures are professionally sculpted and feature the realistic colors and lively detail you expect in our larger Safari Ltd® replicas. 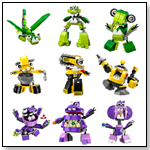 The Fun Pack includes eight figures: Spinosaurus, Pterosaur, Apatosaurus, Stegosaurus, Brachiosaurus, Dimetrodon, Triceratops, and Tyrannosaurus rex. Don't worry; this fish won't bite. Now children can hold a Piranha in their hands. The wild animals in our Incredible Creatures® collection are the largest figures of any set, making them perfect for kids. For added value to both children and collectors, most of the replicas in this collection are made to scale, and some are even life size. 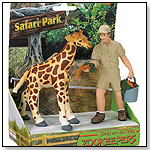 Like all Safari ltd® figures, these educational toys are professionally sculpted and hand painted for accurate detail. The scale of this Piranha is 1:2. 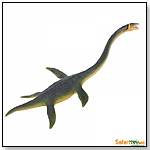 Attention mystery lovers: Legends, myths, and age-old stories have united in our Cryptozoology Designer TOOB®. Explore the wonders and mysteries of the past with these superior-quality miniature toys. Designer TOOBS® are specially designed collections of small, hand-painted replicas featuring vibrant colors and professional sculpting. Each themed set of fun and educational toys comes in a reusable cylindrical tube that slides open and closed for easy storage and transportation. The active poses and accurate details of these collectibles are ideal for projects and dioramas. Most importantly, children can learn while playing with the tiny replicas. This set features seven cryptid toys: Bigfoot, Yeti, Loch Ness Monster, Jackalope, Kraken, Furry Trout, and Coelacanth. Take a big bite with the Wild Safari® Monolophosaurus, an ancient meat-eating dinosaur from Safari Ltd® This new for 2014 hand-painted figure measures 7.5” long ( 19.25 cm) and is appropriate for ages 3 and up. All Safari Ltd® products are 100% guaranteed and are lead free to ensure children’s safety. 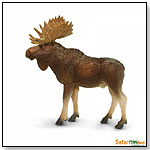 Visit safariltd.com to view and purchase Safari Ltd® toys and explore educational information in five languages. products and explore educational information in five languages. Safari Ltd® brings the Gryposaurus from 75 million years ago to life with this replica of the most abundant duckbilled dinosaur of the Cretaceous period. The hand painted replica measures 8.5” L x 3.24” H (21.75 x 8.5 cm) and is suitable for ages 3 and up. All Safari Ltd® products are 100% guaranteed and lead free to ensure children’s safety. Visit www.safariltd.com to view and purchase Safari Ltd® products and explore educational information in five languages. Freeze time with this Safari Ltd® Flying Fish, and study the torpedo-shaped body of this miraculous creature before it flies out of your hands! The scale of this hand painted replica is 1:2. It measures 7” L x 5.25” H (17.5 x 3.5 cm) and is suitable for ages 3 and up. All Safari Ltd® products are 100% guaranteed and lead free to ensure children’s safety. Visit www.safariltd.com to view and purchase Safari Ltd® products and explore educational information in five languages. 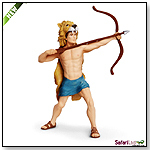 Dressed in lion skin with his arrow strung, aimed and ready, the fearless 2013 Hercules from Safari Ltd® is ready to take on the most challenging of tasks.This hand painted replica measures 3.75” W x 5.25” H (9.75 x 13.25 cm) and is suitable for ages 3 and up. All Safari Ltd® products are 100% guaranteed and lead free to ensure children’s safety. Visit safariltd.com to explore educational information in five languages and to view and purchase Safari Ltd® 2013 introductions and all other products.